Asian food streets are quite possibly my favorite place to visit. Often small, out of the way, and most popular after dark, these food streets have everything a budget minded traveler is looking for and more. But every now and again you come across a place where you know you have no place going to, but an unexplainable calling draws you in. Beijing’s Wangfujing Street was mine, and my unexplainable drawing had a name: scorpion. 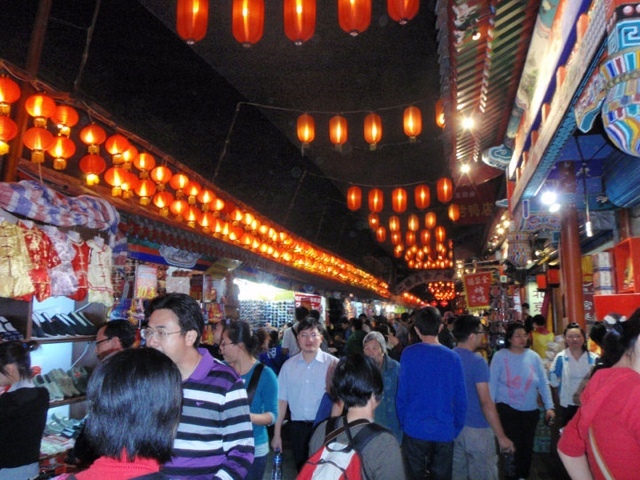 Wangfujing Street is no ordinary food street. This infamous side street in Beijing is famous for housing a collection of the weirdest, grossest foods you can imagine; and in good Chinese fashion, served fried on a stick. Before nerves could get the best of anyone in our group, we went for the main attraction first and had no trouble generating a crowd to watch us consume it. If having a mission to try scorpion isn’t bad enough, being faced with two options is most certainly worse. 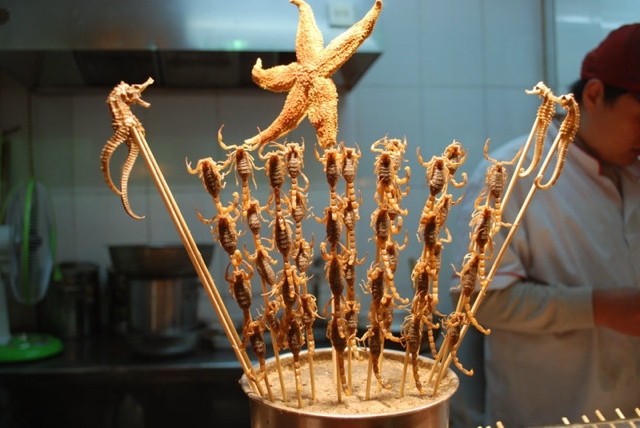 Do you go for the small scorpion or the extra large scorpion that is likely to have more inner juices? 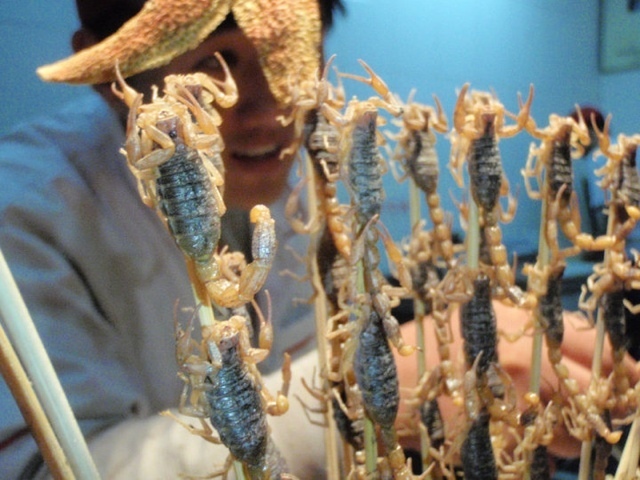 Conveniently the little scorpion were served four on a stick, and I just so happened to be there with a group of four. A cop out, maybe, but a 20 yuan snack (~$3 US) split between four is an easy choice. Being the crazy one, I tried first. Before I knew it, our group was ordering snake. After having scorpion it sounded a lot tamer, and the 15 yuan price wasn’t half bad either (~$2.25 US). Once again the portion was large enough that all four of us shared, and we were all in unanimous agreement that snake tastes exactly like chicken and was overly salted by the chef. Boo! My adventurous eating on Wangfujing Street came to an end after these two endeavors, as everyone in our group decided to fill up on more tasty treats such as Tanghulu (sugar covered fruit on a stick), spring rolls, gyoza, and other familiar items. But there are so many other items on Wangfujing that are just begging for someone to come along and try them. There are starfish, seahorses, cockroaches, millipedes, centipedes, lizards, things that look like rats, live hearts, and countless other organs that I did not even recognize. To be left to someone else I suppose. Are you up for the challenge? Check out Jeremy’s new book which was just released! 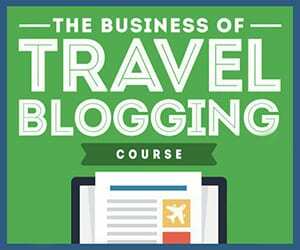 The Long-Term Traveler’s Guide, go check it out! I might try a scorpion… but you could not pay me enough to eat a cockroach. You couldn’t pay me to stand in the same room as a cockroach, dead or alive. HEEBIE JEEBIES. ay ay ay! !no thank you with the scorpions! … thanks for sharing..
Hmmm… not sure about that one. I’d probably give it a try though… as long as I have a cold beer to chase it down with! @Don Faust: No, but I should have. Maybe next time. I saw a video of Samantha Brown (Travel Channel tv show host) eat Starfish though.. and it just looked awful. I’d rather do scorpion. I may have tried a few of those things but I can never really taste the difference. They all taste like chicken to me. Lol. I like the photos you put up though, they don’t make the food look disgusting or anything so good job on that! @Laurence: “anything” cooked on a stick?? hmmm… What else have you tried? NEVER!!!!!!!!! Scorpions almost ran me right out of Costa Rica — they scare me!!! @Abby: That sounds like a great way to get back at them. My next post will have even more.. uhm.. interesting foods from Vietnam.